Also see Machame Route Sample Itinerary. Depart the U.S and upon arrival in Arusha –Tanzania into Kilimanjaro International Airport you are met by your naturalist guide and help you gather your bags and transferred to a beautiful lodge for your first overnight in Africa. Hiking Time: 4-5 hours for the first day. Drive from the lodge to Londorosi gate. Once you arrive at the gate, you will sign in at the park office. Shortly after that, your guide will drive you to the starting point (about an hour drive from the park office). Once you arrive, you will be ready to start hiking with your guides. On the trail you are going to walk through a rain forest heading up to Forest Camp. Lunch will be served on the trail and dinner at the camp. This morning after breakfast you are going to walk through a new climate zone which is alpine moorland, thick with heather zone and vegetation draped in bearded lichen. You will also hiking across the rocky shira plateau where you will get to see a view of Mt.kili from above the clouds for the first time. Lunch will be served on the trail and dinner at the campsite. Today is a short hike. You will continue to walk and exploring the shira plateau and enjoying the spectacular view of Mt. Meru which is the second highest peak in African continent. You will arrive at the camp on time and Lunch and dinner will be served at the camp. You will get plenty of time to relax and maybe go for a short hike if time allowed. After breakfast, will continue heading to Lava tower camp. Lunch will be served at the camp and dinner as well. Later on after lunch will hike the lava tower peak and will be an optional to hike lava tower. The top of this peak is absolutely gorgeous. It is steep, but not a technical climb. After breakfast, you will start ascent into semi-desert. This is a short hiking day, but it's good because it will give you more time to acclimatize (helping your body prepare for the summit). Lunch and dinner will be served at Barranco Camp. This morning, we are going to descend into the big Barranco valley, which is dominated by the giant Lobelias and everlasting flowers. Scramble up the Barranco wall which is the biggest wall on Mt.Kili. Continue hiking through gorgeous landscapes to the next camp. This day is a bit longer but it's extremely beautiful. Lunch will be served on the trail and dinner at the camp. Today is a short hike, but you are going to ascent through uphill path across the barren rocky slopes. Arrive at the Barafu Camp on time for lunch and relaxing before dinner. Go to sleep early and get enough sleep before heading up to Crater Camp. We start hiking around 3: 00 am. So be ready my friends. 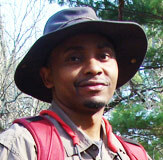 Hiking Time: 6-8 hours ascent to the summit of Kili (19,340 feet) and about 7-8 hours descent to the last campsite. Today is your final day on the roof of Africa. It is going to be a long hike. You will be awakened by your guide before midnight to begin the last challenging ascent. Breakfast will be served then. During the night, it is extremely cold when you reach this point, so you need to dress in a lot of layers. 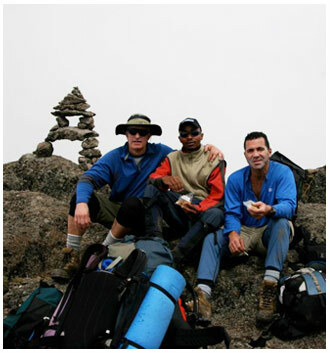 Once you reach the summit, you will be able to take some photos and celebrate your accomplishment before heading back to Barafu Camp for lunch and continuing down a long trail to the last camp of the mountain. Descent down from the summit to Mweka camp is steep, so we highly recommend using trekking/hiking poles. Hiking poles will help protect your knees especially when you are going downhill or uphill. Hiking Time time: 3-4 hours. This morning after breakfast you will continue descent through the rainforest to the Mweka Gate, where you will have lunch and will be awarded climbing certificates and say goodbye to your guides, porters and cooks. You will be transferred back to your hotel for a hot shower. 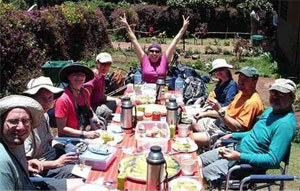 All our meals on Kilimanjaro are prepared by our own cooks/chefs. We provide nutrient-rich, high-energy foods that will digest quickly (ex. pasta, potatoes, and rice). We also provide fresh fruits and vegetables with every meal. We serve small portions of meat at high altitudes (because it is harder to digest). Example Breakfast: coffee, tea or hot chocolate, toast, peanut butter, eggs or bacon. We may also provide porridge, pancakes, and fresh fruit such as bananas, mangoes, pineapple, watermelon and papaya. Example Lunch: fried chicken, boiled eggs, vegetable soup, peanuts, tea, coffee and maybe fresh salad including carrots, tomatoes and cucumber. Example Dinner: vegetable soup, tea or hot chocolate, bread, fried potatoes, sweet potatoes, rice or pasta, roasted chicken and fruit like bananas, oranges and passion fruits.